1Department of Pharmacognosy, Graduate School of Pharmaceutical Sciences, Nagoya City University, 3-1 Tanabe-dori, Mizuho-ku, Nagoya 467-8603, JAPAN. 2Department of Bacteriology, Graduate School of Medical Sciences, Nagoya City University,1 Kawasumi, Mizuho-cho, Mizuho-ku, Nagoya 467-8601, JAPAN. Objective: Shin’iseihaito (xinyiqingfeitang in Chinese, SSHT), a formula in traditional Japanese Kampo medicine and Chinese medicine comprising nine crude drugs, Gypsum, Ophiopogon Tuber, Scutellaria Root (SR, root of Scutellaria baicalensis), Gardenia Fruit, Anemarrhena Rhizome, Lilium Bulb, Magnolia Flower, Loquat Leaf, and Cimicifuga Rhizome (CR, rhizome of Cimicifuga heracleifolia), is commonly used to treat sinusitis associated with purulent nasal discharge and reddish nasal mucosa. We evaluated anti-bacterial activity of SSHT extract on methicillin-resistant Staphylococcus aureus (MRSA), one cause of bacterial sinusitis. Materials and Methods: Sterile paper disks impregnated with SSHT extract, the combination of crude drugs composing SSHT according to the traditional pharmacological theory, or each component were placed on Mueller-Hinton agar plates inoculated with several strains of MRSA isolated from the patients. The diameter of inhibitory zone was measured after 18–24 h incubation. Results: SSHT extract showed antibacterial activity against 128/190 (66.8%) MRSA clinical isolates. The effect of the extract of SSHT without heat-clearing drugs (SSHT–HC) or without exterior-releasing drugs (SSHT–ER) were significantly lower than that of SSHT extract. 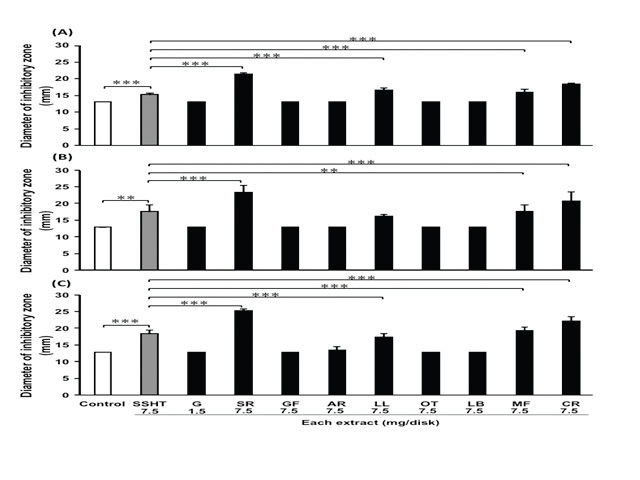 Each water extract of SR, Loquat Leaf, Magnolia Flower and CR showed significant anti-MRSA activity, and SR extract exhibited the largest inhibitory zone. Conclusions: SSHT has antibacterial activity against MRSA clinical isolates, and SR mainly contributes to the antibacterial activity of SSHT against MRSA clinical isolates. Konishi T, Minami M, Makino T. Antibacterial Activity Of Shin’iseihaito (Xinyiqingfeitang) And its Components Against Methicillin-Resistant Staphylococcus aureus. Pharmacognosy Journal. 2017;9(3):310-314.